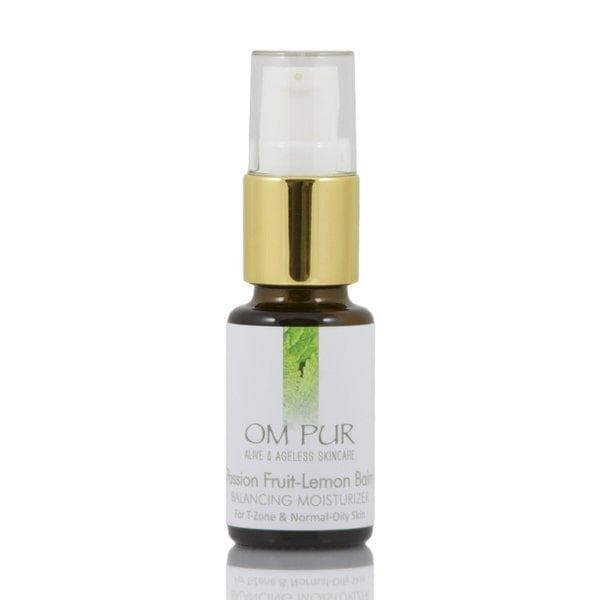 Om pur balancing moisturizer includes sebum-balancing passion fruit oil, astringent herbs and essential oils. When your skin wants to be less oily but not too dry slightly oily or t-zone skin is characterized by some enlarged pores, especially around the nose, occasional blackheads or breakouts, and surprisingly - often dehydration in the deeper layers of tissue. When the skin becomes dehydrated, it attempts to seek balance by secreting excess oil from the skin's sebaceous glands. When oily skin becomes hydrated, it produces less oil because the sebaceous glands no longer senses the need to create hydration. The foremost solution to create balanced oil secretion in skin is to drink plenty of water and eliminate dehydrating beverages such as caffeinated drinks, alcohol, soda or sugary drinks. The next step is to hydrate the skin topically. (See 'Lavender-Neroli Toning Mist'.) Third, is to use an oil-balancing moisturizer. Om pur balancing moisturizer includes sebum-balancing passion fruit oil, astringent herbs and essential oils to help reduce excessive oiliness while gradually balancing the skin's natural oil secretions. Lemon balm and other calming and antimicrobial ingredients help slow down sebum secretion and purify skin. You'll love the citrus-vanilla aroma! Directions: Use morning and/or night. Apply after cleansing or exfoliating, or after misting. For a lighter application, blend 1-2 pumps of oil with 2-4 pumps of 'Lavender-Neroli Toning Mist' in your palm and apply together. Use morning and/or night. Apply after cleansing or exfoliating, or after misting. For a lighter application, blend 1-2 pumps of oil with 2-4 pumps of 'Lavender-Neroli Toning Mist' in your palm and apply together.